With 15 Beers on Tap and the Largest Menu in Town we offer great food at great prices in a comfortable, casual, friendly setting. 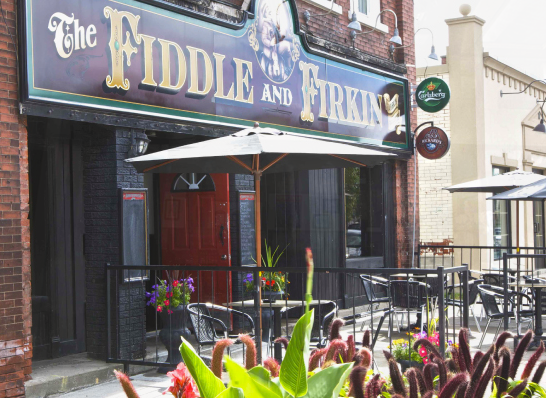 Come check out our newly renovated traditional Firkin Pub in the heart of downtown Cambridge. The Fiddle and Firkin offers all of your traditional pub favourites! Our brand new bar and seating area hasn't changed the atmosphere you expect to find at the Fiddle, but it's definitely elevated the experience! With delicious daily food and drink specials, we aim to satisfy every taste bud. We've recently renovated to give our bar a new look while maintaining our traditional British roots, so whether you want to check out tonight's big game or join us ofr one of our live music nights, there's always something going on at the Fiddle. Please NOTE: Prices may change without notice. Thank you. Live Bands Rock & Roll, acoustic guitar, folk, jam nights. Anything from our Fiddle & Firkin menu can be prepared to take away.